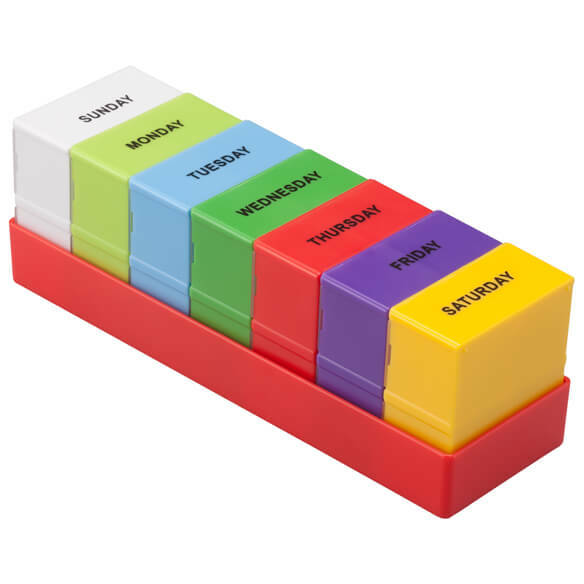 Spacious, colorful 7-day 4-compartment pill organizer helps ensure simple, accurate dosing. 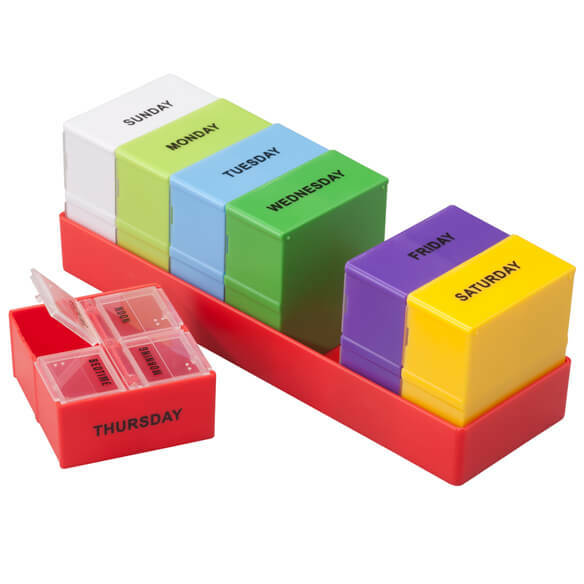 Seven pill containers are not only labeled with each day of the week, they're color coded for safe, easy selection at a glance. Each removable daily pill box features 4 separate compartments clearly labeled in black contrast letters for morning, noon, evening and bed. 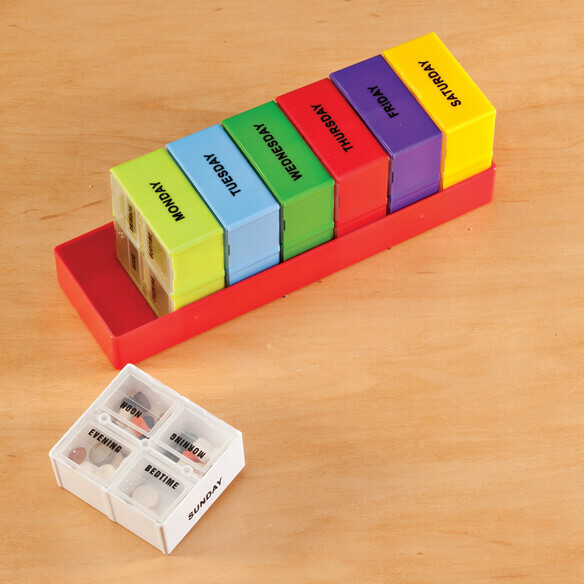 3/4"L x 1"W x 1"H compartments are large enough for all your vitamins and medications. Lids secure closed to prevent spills. Includes 7 pill holders and storage tray. Perfect for use at home and on the go. Please save your money! I am SO disappointed! I thought this would be just what I needed! WRONG! The lids won't stay closed, and you can't get the pills out, without turning container upside down. So you dump out pills you WANT to stay in the container. If I hadn't tried to use it for one week, I would definitely send this worthless plastic back. I thought it might be a little easier than the one I have now. Already have two, but ordered this for a friend. I like the bright color coding, seems like it will be easy to use. 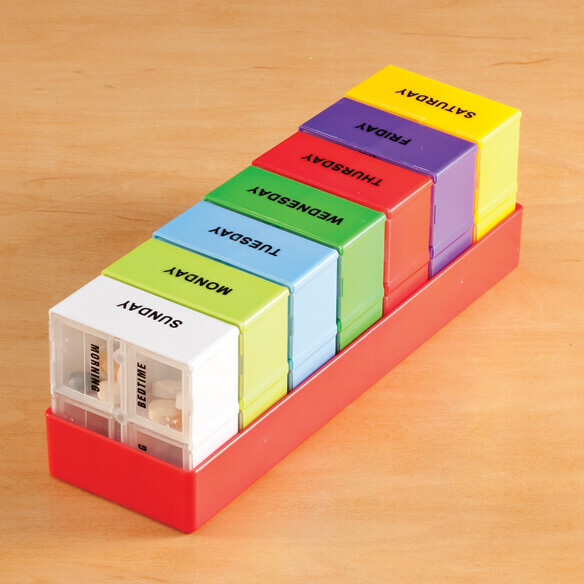 Wife looking for pill organizer to replace and backup the one she has. This is an experiment.